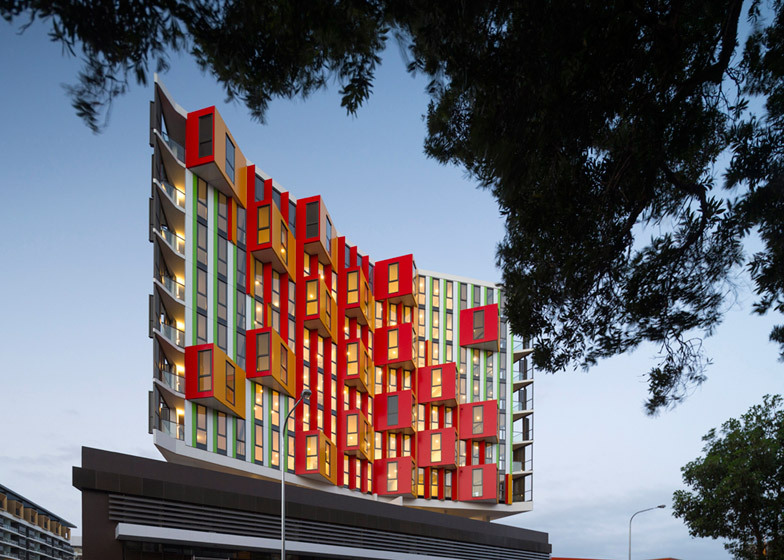 The triangular window bays that project from the facade of this Sydney housing block by MHN Design Union appear either red or yellow, depending on the viewing angle (+ slideshow). 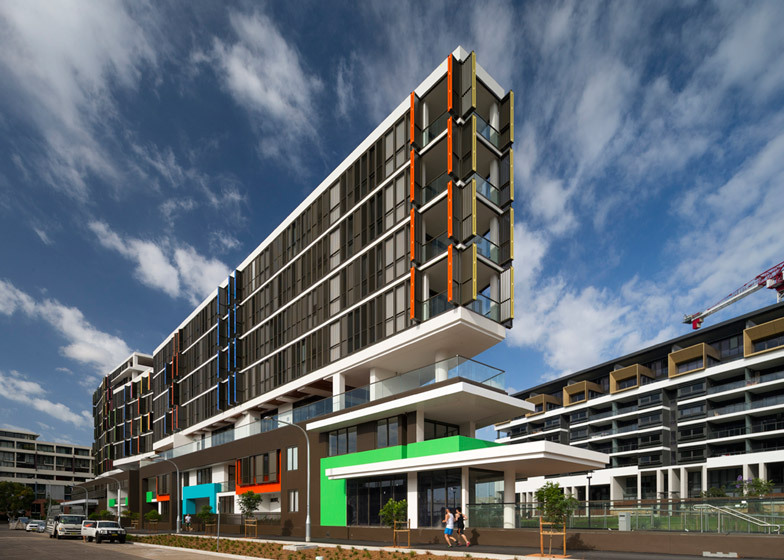 Sydney-based MHN Design Union designed the Viking apartment block for local developer Crown Group on a plot in Waterloo, a former industrial area that is gradually being redeveloped into a residential neighbourhood. 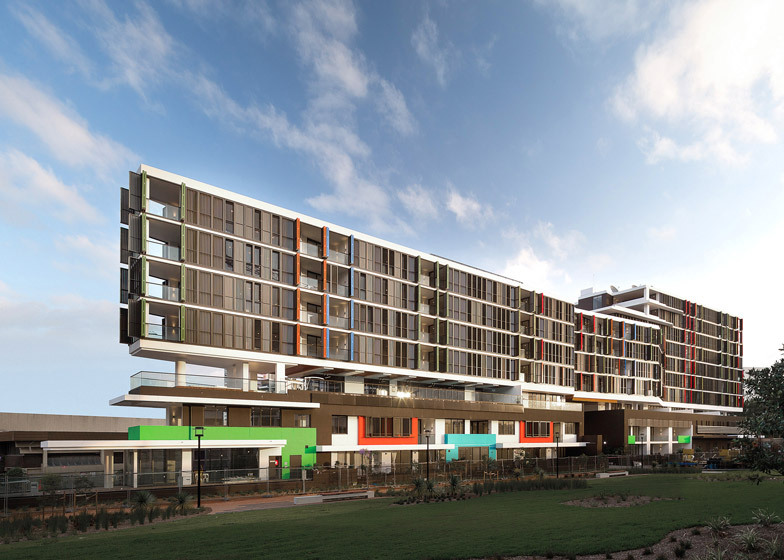 The architects based the design of the facade on the sculptures of Yaacov Agam, an Israeli artist who is known for his brightly coloured kinetic and optical illusion works – which also influenced a series of rugs by London studio Raw Edges. Nineteen triangular bay windows project towards the city on the north side of the building. 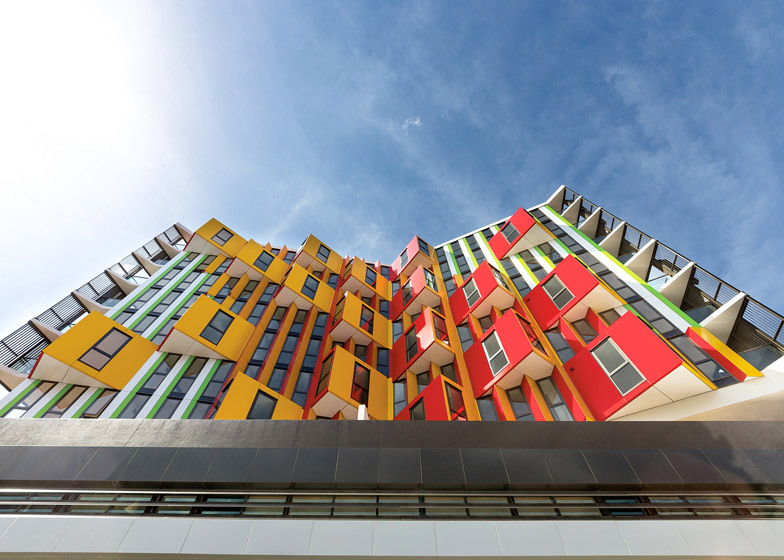 Each is coloured red on one side and yellow on the other, meaning the building appears differently depending on whether its approached from the left or the right. 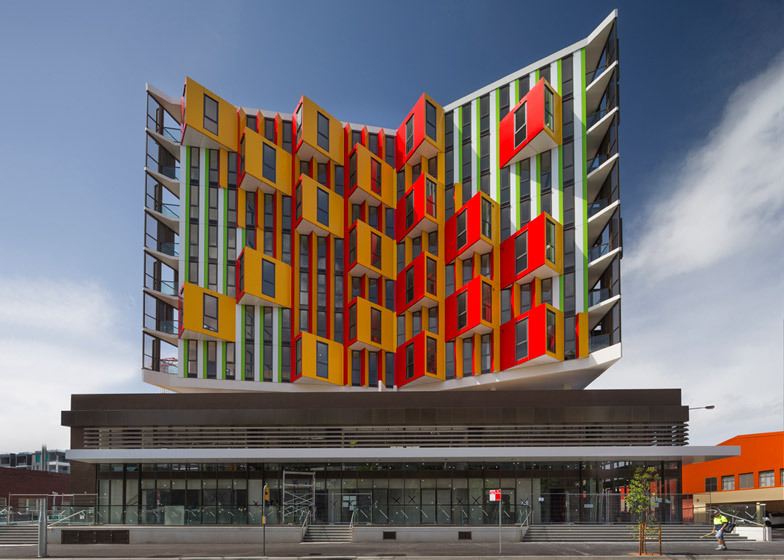 "These projections are coloured externally so that when viewed from the west the dominant colour is red, and when viewed from the east the dominant colour is yellow," the architects said. "The result is a perception of shifting colour related to movement that is underscored by the dynamic formal composition." 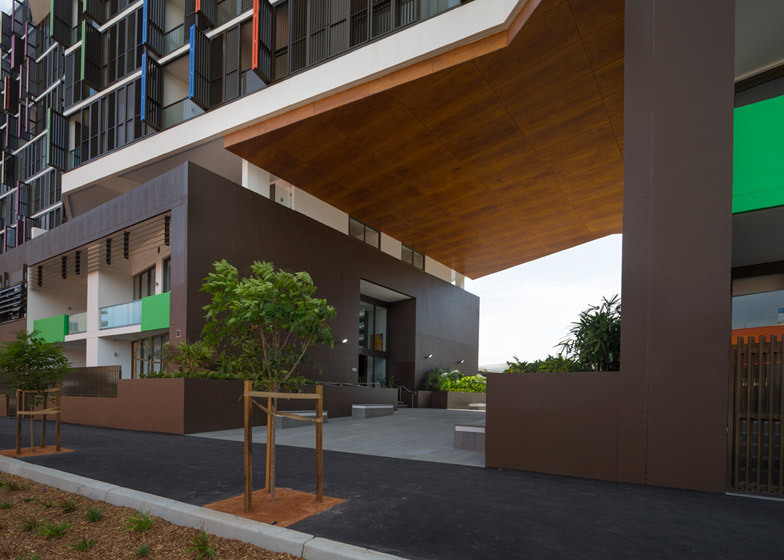 The building's form tapers to a point at the rear, creating triangular floors that range from 10-high at the front to seven at the back. The widest end is covered in the triangular windows, while the long sides face onto streets and parkland. "Viking by Crown is an unusual building for an unusual site," said the architects. "The building reflects the acutely triangular site and resembles a compass point facing north towards the city skyline." 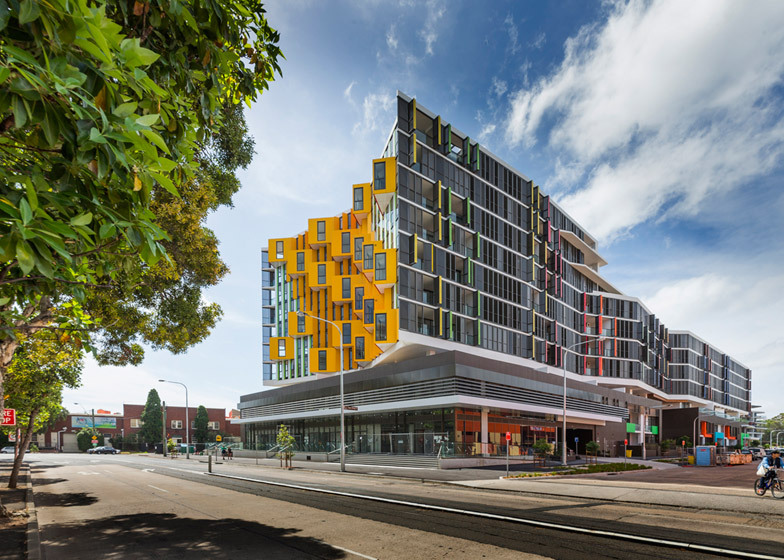 "The project's east and west facades are long and calm, while the south presents a kinetic art facade to the busier traffic street. The project is outward looking, positive and joyful." 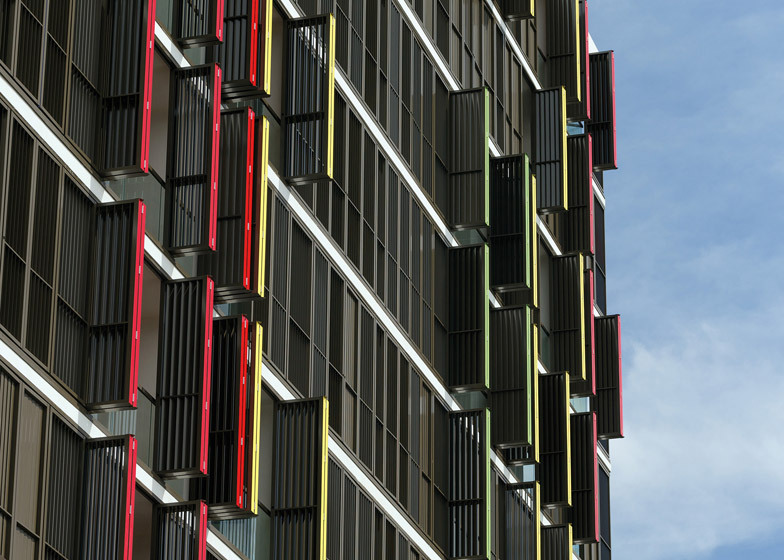 Mechanical shutters screen the glazed walls of the 110 apartments within, providing privacy from passing traffic and shade from the sun. When these shutters are closed they cover the building's flanks in a muted bronze-coloured grille, but when open they project from the facade like fins to show brightly coloured hinges. A 25-metre-long pool stretches along the one side of the second floor. 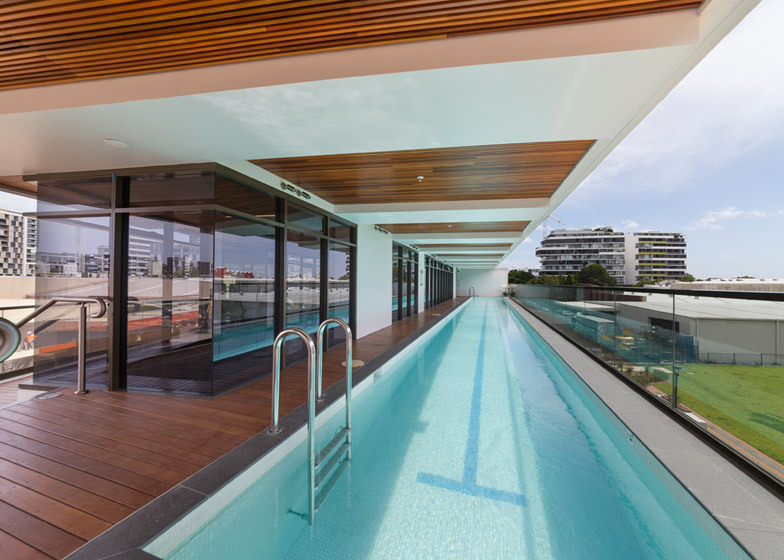 Surrounded by glass balustrades, it gives swimmers views over the city and adjacent parkland. The building is shortlisted for two awards at this year's World Architecture Festival, which will be held in Singapore at the beginning of November. Photography is by John Gollings.